Hello November! Comfort foods are on the dinner table and this is a spin off from the pot pie recipe I shared the other week. The filling is exactly the same- I just opted to make parsley biscuits instead of pie crust. Sometimes when you present a meal in a new way it feels fresh. 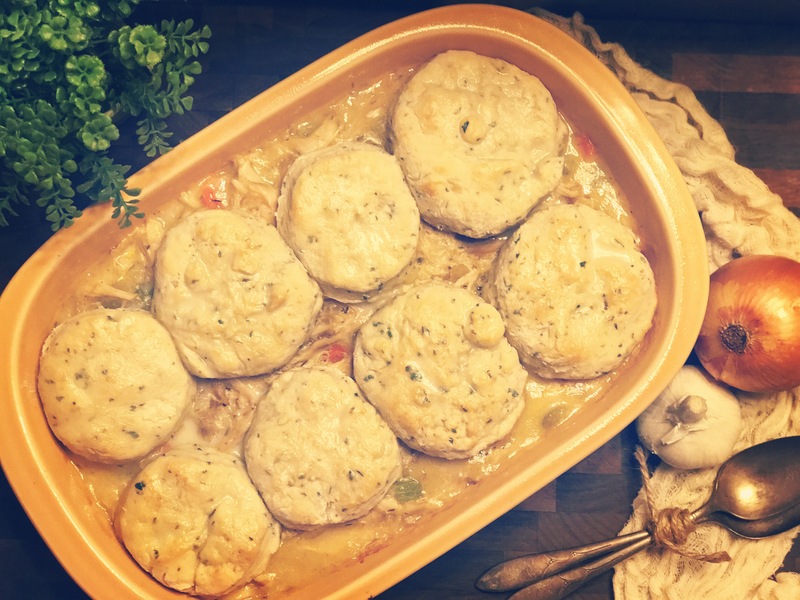 The biscuits sop up the gravy filling and also reheat well as leftovers. Feel free to try this with turkey after Thanksgiving is over. Filling recipe can be found Here on my original pot pie post. Make it exactly as stated except pour filling into a 11″ x 13″ casserole dish. Then make the biscuits as follows. 1. In a large bowl, whisk the flour with the baking powder, salt, sugar and parsley. Mix well. 2. With a fork, stir in the heavy cream until moistened. Turn the dough mixture out onto a floured surface and, with floured hands, knead 3 or 4 times, just until the dough holds together. 3. Pat into a circle about 1/2 inch thick and cut out with a 2-inch biscuit cutter. 4. Arrange the biscuits over the chicken mixture in the baking dish. 5. Gather the dough scraps together and cut out more biscuits, placing on the chicken mixture or on a greased baking sheet or pan. Repeat until all of the dough is used. You may also freeze extra raw, cut-out biscuits on the baking sheet. Put the frozen biscuits in a freezer bag and bake them at another time. 6. 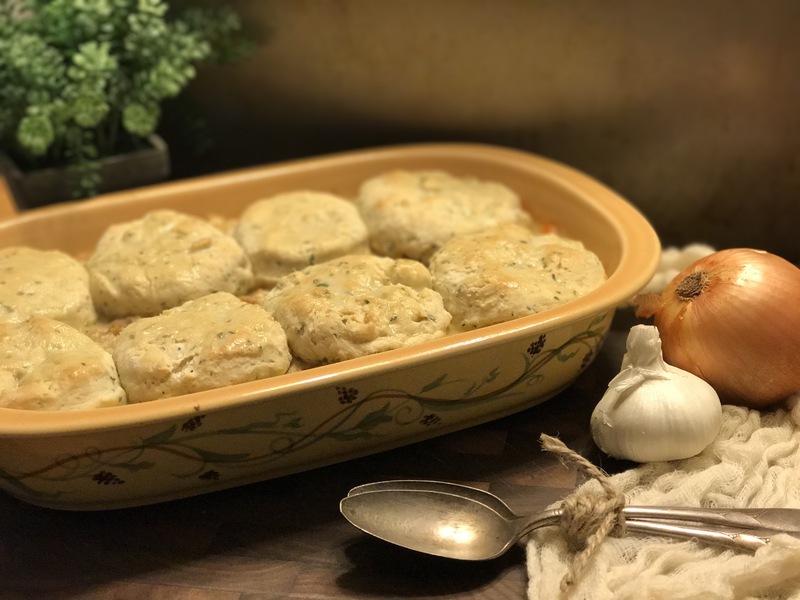 Bake the chicken and biscuits and the plain biscuits until browned, about 20 to 25 minutes. 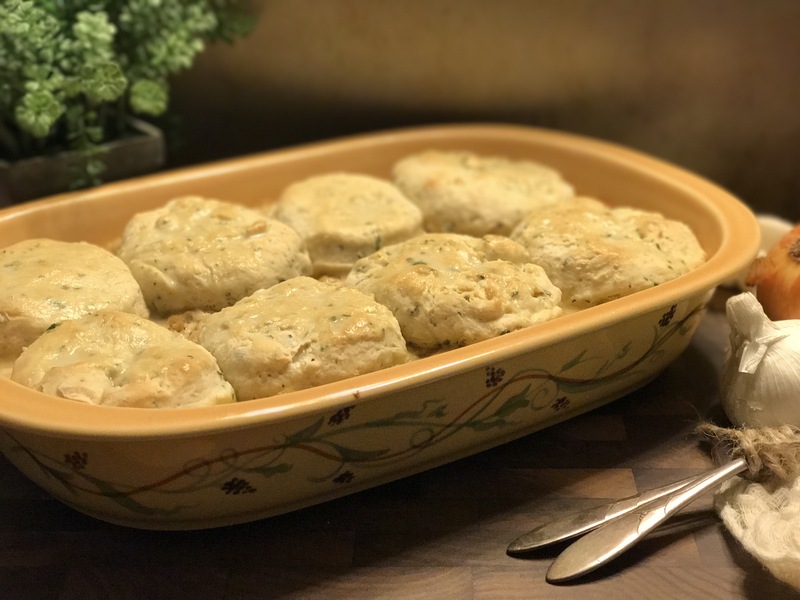 Remove from oven and brush biscuit tops with butter. Serve immediately. This dish pairs nicely with a fresh garden salad. It’s warm and hearty and will fill your family up on a chilly evening.